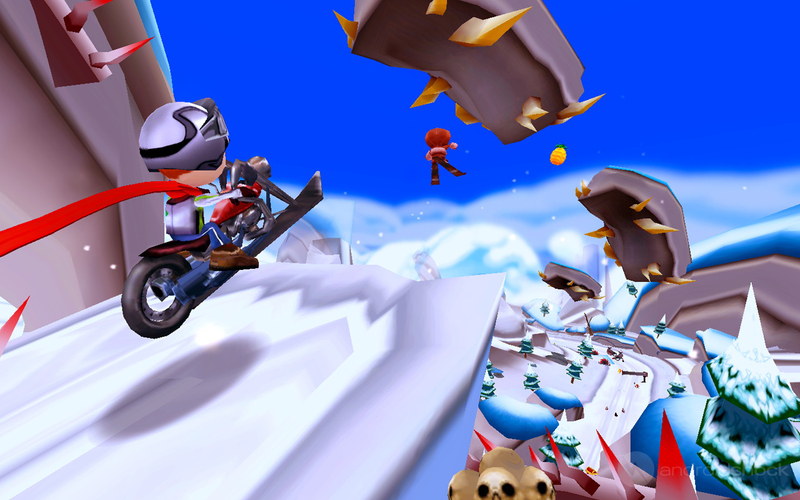 Fred, the very unlucky protagonist from CreepyChunk Games series’, is at it again but this time he has taken to skiing…perhaps it is less dangerous. Previous installments of the Fred fandom include Running and Falling Fred, where Fred is well…running or falling. Not one to stay stale the new Skiing Fred video game stays true to the very gory and crazy course theme as previous Fred titles but with the added dynamic of skiing. 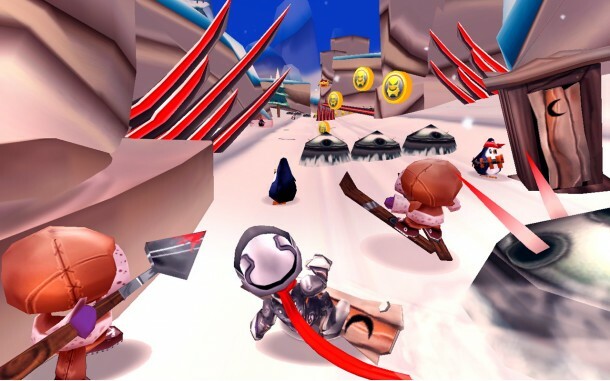 So put on your snow pants, brace for the cold and hop down the mountain as you are in for a wild ride full of bloody spikes, penguins and lots and lots of death. 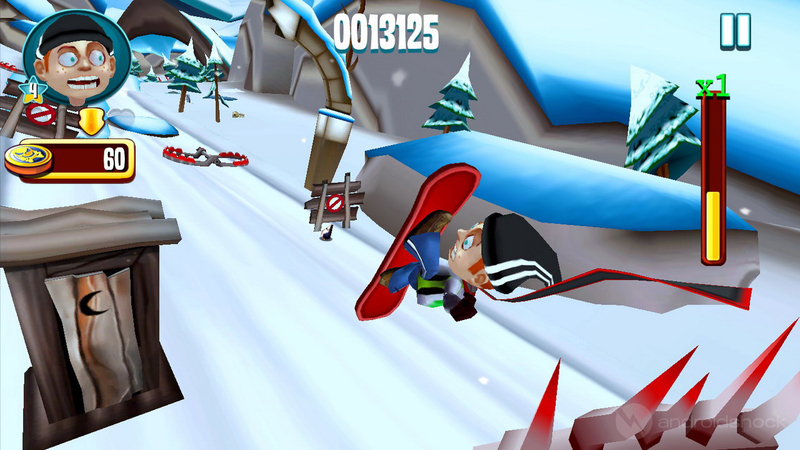 One of the toughest challenges I found with Skiing Fred is actually the controls. I remember playing the flash version of Running Fred and it was simple WASD controls but on the likes of a handheld device it is all tilt motion control. To be fair this is how most of these type of games play and CreepyChunk’s own Falling and Running Fred mobile games are the same…aside for one point. Skiing Fred seems more open ended and the skiing controls seem more sensitive perhaps to try and emulate actual skiing. What ends up happening, at least on my side of things, is very sensitive hard to manage controls. I found myself shooting off into the outskirts of levels plenty of times or not being able to dodge obstacles as well as I would have liked. This is a shame really as Skiing Fred really requires tight controls to be good since 70% of the environment is intractable in some way (good or bad) and if you can’t get to where you want you end up getting screwed over quite a lot. Other controls that are necessities is the jump/double jump button (which I also found to have a hard time registering but could be a user error), slowing down and then slamming. 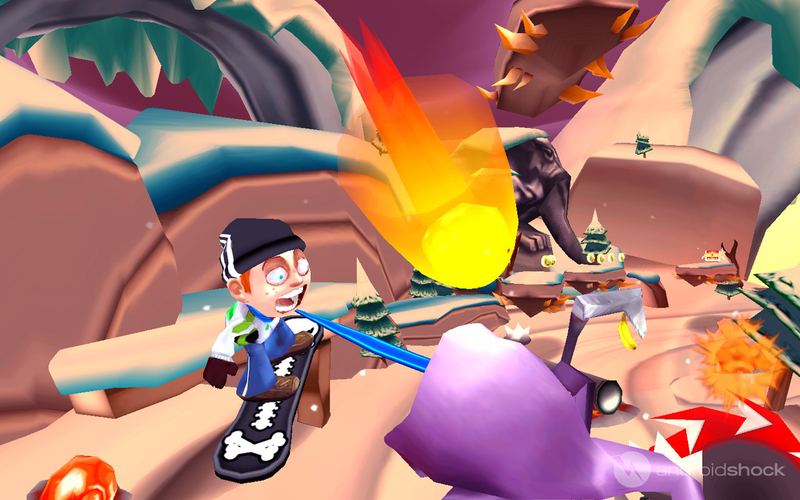 Slamming is interesting as basically during a jump you can hit the brake button to slam on the ground destroying deadly obstacles. 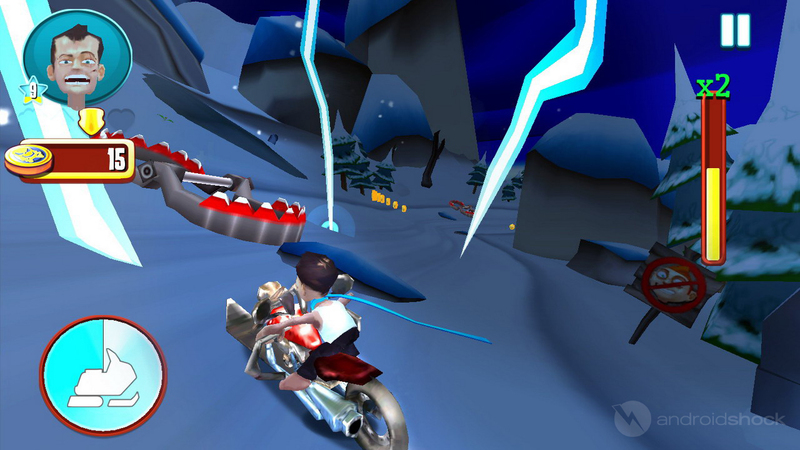 All of these controls work together to give you the movement freedom to avoid the obstacles in whatever way you want. You can double jump and try to climb the level higher and higher, slow down to a crawl to avoid everything, slam and break everything or just sprint through the course. The freedom is yours. Perhaps the best aspect of Skiing Fred and the most fun is just how many obstacles and dangerous events are pitted against you. Once you start down the slope you will have to avoid a multitude of traps that may look familiar if you’ve played the other Fred games. You have long bloody spike strip traps, saw blades, revolving maces and bear traps to just name a few. On top of those deadly obstacles you have to avoid general pitfalls, boxes and blockades which slow you down (ski too slow and the Grim Reaper behind you will kill you), evil gnome looking things and special events. Special events are an interesting touch which add an element of extreme danger to Fred. These events are such things like lightning strikes, meteor showers and blizzards. They last for a limited time but if they occur again in your run will get worse and worse. An example of that is level 1 meteor showers leave huge craters in the ground that you can run over, however level 2 meteor showers leave molten rock in the craters causing death if you run into them. Luckily the course is fairly large allowing for different paths depending on if you jump at this point or swerve at this point. It is hard to plan your path but you are not stuck with one linear path. 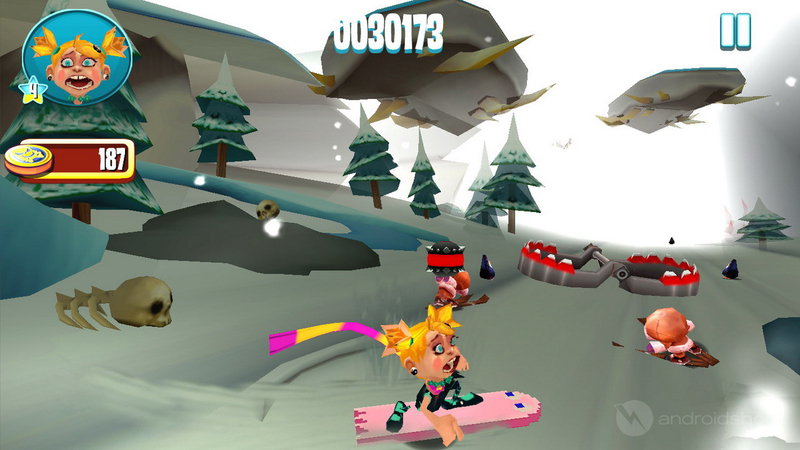 Even better is the fact that each time you play the slopes are random. The general idea is the same, along with obstacles but different paths and arrangements. 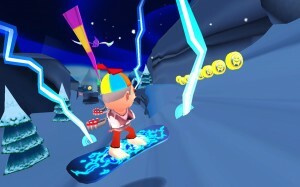 Skiing Fred is not all doom and gloom, there are some good items and powerups to help you and protect you in your ski run. These range from score enhancers/multipliers in the form of fruit, treasure chests, and special skull coins. In addition you can pick up shields, mystery boxes, emeralds to help purchase things and vehicles a la Jetpack Joyride. The vehicles really offer a whole new dynamic to the Fred franchise. Some of these vehicles include snowmobiles, jetpacks, giant snowballs and a dinosaur that picks you up and flies you forward. Of course there also tons of coins to collect which you can then spend in an upgrade shop to help you upgrade vehicles, your powers, new skills (like the slam skill) and aesthetic options such as new characters, boards, scarves and other outfits. Now this is kind of a sore subject for me but I know it is how developers make money on free or cheap mobile games but I have seen that CreepyChunk really takes the notion to the next level in their Fred games and Skiing Fred is no different. With the basic download you get access to one of four levels (two are not released yet though) and the basic Fred character and his outfits. The shop, though, is pretty vast and you can again purchase things ranging from vehicle upgrades to new characters/levels. Most of the upgrades, for at least skills, can be purchased with in game coin currency although it would take a lot of grinding to get enough for some fairly basic upgrades. The rest cost emeralds which you can find in game but very rare. This forces you to use real money if you want a full Skiing Fred experience, just wanted to give that heads up. Basic Skiing Fred is still fun but will get old fairly quickly unless you A. really love these types of games and can play it over and over again or B. pay to get new content now and when it gets updated.